One of the more frustrating things about the internet, is that sometimes there is too much information. But you can’t find the answer to your question, being led in about a billion directions at once. What you were looking for could right under you nose… But you would have no idea. Even if you are able to find a fragment of some kind of information, you may not be able to decipher it. Researching the music of Vietnam on the web is a good example of this. There is almost no information in the way of biographies or articles from that time period (1963 – 1975). But then you can find literally hundreds of videos on YouTube and DailyMotion. And it doesn’t help that you almost have to already know Vietnamese to be able to use the online translation program. But since the last posting on Hūng Cuōng, some information has turned up. Apparently, he is alive and well living in “Little Saigon” (not sure if that is the Orange County “Little Saigon” or the San Jose “Little Saigon”), California in the United States. His granddaughter and grandson have also started a MySpace page for him. He still performs live, occasionally with Mai Lệ Huyȇn̅ . They even have re-recorded this song, and made a video for it. 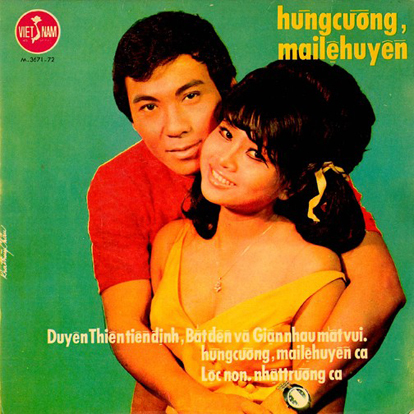 Other than that, all I have be able to find are some great songs by both Hūng Cuōng and Mai Lệ Huyȇn̅, played over footage of the South Vietnamese Military here and here. Thanks to Greg McWhorter for the information. Catalog number M.3671.72 on Viet Nam Records. No release date listed. Phương Tām was from Vietnam. 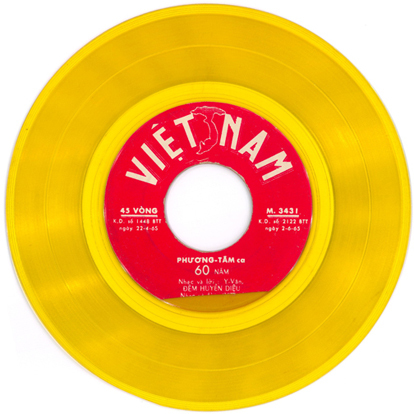 When I first started tracking down records for what eventually became this site, I was under the impression that Vietnamese vinyl from the 60s and 70s would be the hardest to find. But, I have since been proven wrong. That’s not to say that they are easy to find… But considering the number of compilations of amazing of Thai and Cambodian rock and roll that are readily available… Why not Vietnam? 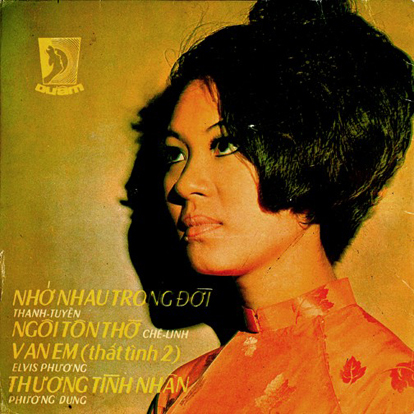 Catalog number M.3431 on Việt Nam Records. No other information available. Elvis Phương was from Vietnam. Elvis learned to sing by listening to the records or tapes of foreign singers. When he was 17 or 18 years old, against his father wishes, Elvis Phương chose to stay in Vietnam to pursue a career in singing instead of going to France for an education. Elvis Phương, whose real name is Pham Ngoc Phương selected his stage name after his idol, Elvis Presley. His first appearance in front of an audience was in 1962 at Regina Pacis high school’s open house where he sang Nua Dem Ngoai Pho and O’ Cangaceiro. The first band that he worked with was the Rockin’ Stars, a popular band during the early 60s. In subsequent years, he also collaborated with other famous bands such as Les Vampires and Phương Hoàng. 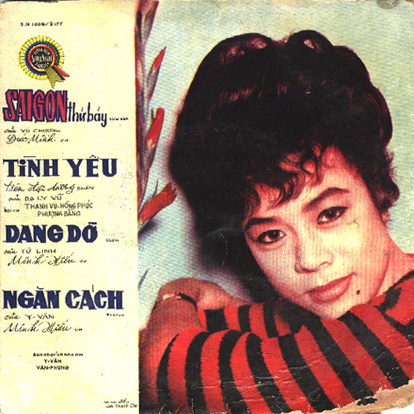 In 1968, Mr. Ngoc Chanh of Shotguns Productions produced Elvis Phương’s first album titled Shotguns 26: Tieng Hat Elvis Phương. 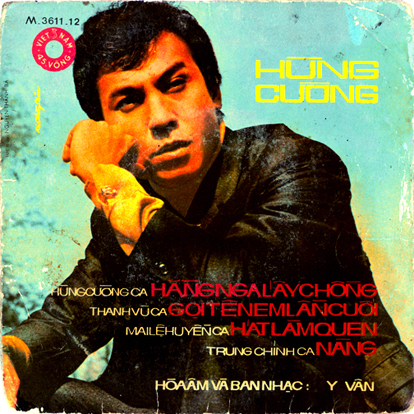 In 1977, Elvis Phương’s musical journey took him by storm with the first album produced overseas titled Hat Cho Nguoi Vuot Bien. Since then, Elvis Phương has recorded many tapes and / or CDs and appeared in many videos. He currently lives in Cerritos, California, where he runs EP Productions. He also has a website (that is under construction). And, apparently he is an Aquarius (his birthday on February 1st), his favorite color is black & white and his lucky number is thirteen. There is a separate catalog number for each song on this record… The catalog number for this song is GP • 1287 31 3 7 on Dưâm Records of Vietnam. No release date given. Hūng Cuōng was from Vietnam. Unfortunately, this record has seen better days. The cover needed a bit of Photoshop work, but the vinyl… Sound Soap can only do so much. Catalog number M.3611.12 on Việt Nam Records. No other information is available. These songs fall a bit more into the Easy Listening or Lounge category, but the use of reverb on both tracks is quite interesting. Also this record came out in 1966, which was one year after the U.S. troops arrived in Vietnam. Catalog number S.N.1009 / 2177 on Sōng Hnac of Vietnam.